THE WALDHEIM WALTZ is a quietly powerful and beautifully curated documentary by journalist Ruth Beckermann about the election campaign of the late 80s Austrian President Kurt Waldheim. It opens and closes with Beckermann's own black and white footage of the diplomat turned politician and later the public reactions to revelations that he had - at best - falsified his war record and - at worst - been implicated in war crimes against partisans, and of being part of the Nazi apparatus that facilitated the deportation of Jews from Salonika. Beckermann rightly shows how the war record of Waldheim is, in a sense, not the most important point. The real crime is his seeming inability to tell the truth - his continual plea that the Austrians should also be seen as victims - and how this reflects the wider weirdness that Austrians have around their record during World War Two. A commentator at the time rightly points out that the Allies let Austria off the hook with the concept that they were the "first victim" of Hitler. And indeed this may be right when we consider the Austrian State. Nonetheless, once the anschluss was completed, Austrian individuals were, just as Germans, members of the Nazi armed forces, intelligence services, the SS, and were of course implicated in war crimes. Not least Waldheim's one time boss, Alexander Loehr. Perhaps the most haunting this in this film is not Waldheim's slippery smugness, but the continued anti-semitism in 1980s Austria. The coded language when Waldheim or other commentators speak of a small minority of influential people in the media attacking Waldheim is dog-whistle speech. Even worse, the blatant anti-semitism in the streets of Vienna. When man asks an anti-semite what makes him feel so complacent that he can shout anti-semitic abuse in St Stephen's Square. The unspoken response is that he feels sanctioned by the election of a man he thinks shares his views. Beckermann chooses to only use footage up to the and shortly after the election of Waldheim and barring a few comments about her own footage she does not editorialise about what this shameful episode might say about contemporary Austria or politics more widely. Certainly, there are lessons one might draw about Trump sanctioning a renewed confidence among American white supremacists. But far more disturbingly, I would want to know whether this kind of base-line historical equivocation and knee-jerk racism still exists in Austria. Is there still an older generation that thinks the Jews had it coming? If the attitudes hadn't changed between 1946 and 1986 have they really changed now? Is the way the Holocaust and Austria's role in it is taught in schools there different? Or is the convenient denial still present? 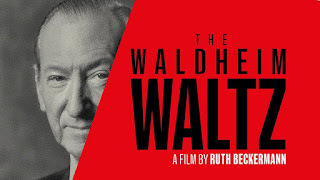 THE WALDHEIM WALTZ has a running time of 93 minutes. It played Berlin 2018 where it won the Original Documentary Award. It played Sheffield DocFest earlier this year, and is currently playing at the UK Jewish Film Festival. It is the official submission of Austria for the Oscars 2019.